I love all kinds of chocolate martinis! Have you noticed that yet? I’m not huge on actually eating chocolate, but drinking it is another matter. This one only has 3, that’s right three, ingredients! Right before Halloween I was scrambling to find a rebate hang tag for UV Vodka. I swear I checked every single liquor section at every store we went to. I finally found a single one late in the afternoon on Halloween, the very last day it was valid. It was a great rebate as it was good for $10 off one bottle of chocolate cake, cake or whipped cream flavored UV Vodka. I bought the cake flavor as I thought it would pair perfectly with Lulu B.’s Chocolate Martini. I can gladly tell you that it does! Add all three ingredients to a cocktail shaker, plus 5-6 ice cubes. Put the lid on and shake for approximately 30 seconds. Strain and pour into martini glass. Serves 1. 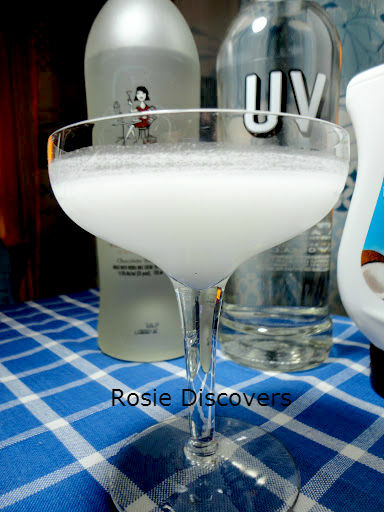 Someone else wanted to name this drink the ghost martini as we made it on Halloween and due to its ghostly appearance. What do you think? Susie Savors: This tastes just like a slice of cake. 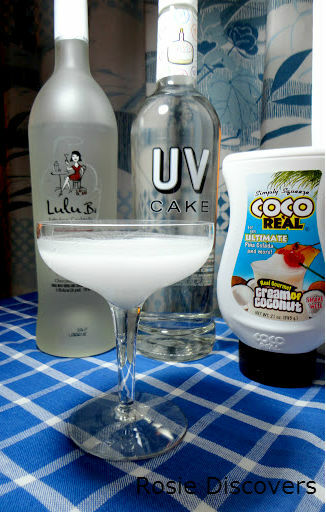 It’s sweet and sultry with that touch of coconut to make it better. The chocolate melds with the cake and you have a dessert that you can drink!